They also have some philosophies to adhere to. Possession football, attacking football and develop young players. I don’t like being judged on possession football, but the board are intransigent: the philosophies stay. Obviously this will impact our chosen tactics. Our starting tactic, for all home games and away games against theoretically weaker sides will be a pretty standard 4231, with attacking full backs, a target man and my two star players in their preferred roles; Alexis Sanchez on the left wing as an inside forward, and Mesut Ozil in the hole as an advanced playmaker. Cazorla and Ramsey will fight it out for the deep-lying playmaker role, next to a ball-winning midfielder, probably Coquelin to start with. I’m going to give a ball-playing defender a bash with Mustafi, next to Koscielny. Cech, Walcott and Giroud all have pretty vanilla roles. I tweak a couple of player instructions, aiming crosses towards Giroud, getting Cech to roll the ball out to the full backs and discouraging Coquelin from doing anything stupid, like running with the ball, risky passes and long shots. Team instructions include a bit of pressing, retention of possession and exploiting the flanks. I’m playing a standard mentality, a touch more aggressive than my usual counter. 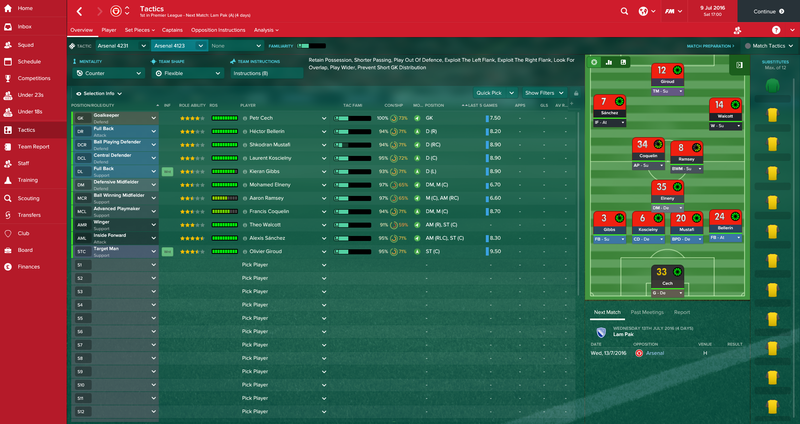 I have also set up a 4123 formation for those pesky away trips to the top sides. 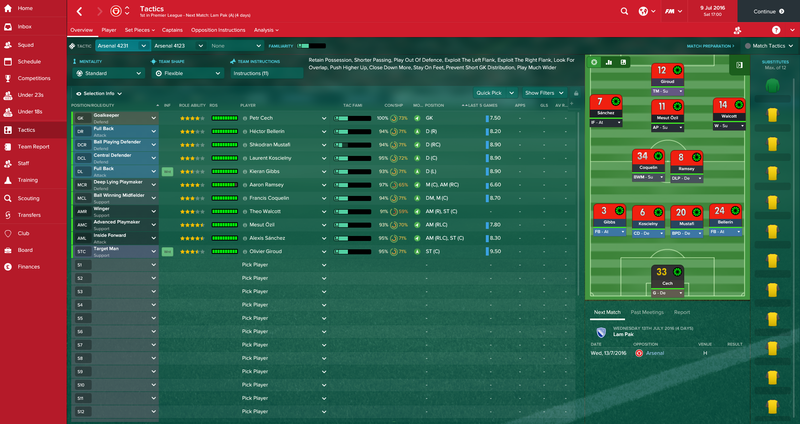 And with Chelsea and Man City (both away) in our first four games of the season, I’ll need it. Elneny should be able to do a job as a defensive midfielder to start with, but there’s no place for Ozil in this formation. It’s pragmatic, but I feel necessary.